Early morning, after breakfast, we left the hotel enroute to Ujjain which was our destination at the end of the day, This was a whole day driving day with nothing else to do. 9:20am We left the hotel. The route planned was first to Dhule and then take A B Road towards Indore. The default route shown by Google Maps goes through Godhra and Dahod but we were not sure of road conditions there, so we went via Dhule. Since we got out of hotel little late, we encountered serious traffic Jams. Most seem to be created by innovative drivers who were driving all over the place, but we were stuck for almost half and hour before we moved. 10:18am Encountered a railway crossing but again the same situation, both sides of railway crossing, vehicles occupied every inch of road and even after the gates opened, nobody moved. Finally traffic police showed up and we moved. 12:07pm Railway crossing near Chinchpada, a total mess. Everybody blocks the road on both sides. First we wait for 15 minutes to cross the railway crossing and then we sit in traffic for another 10 minutes because gate closes again and oncoming traffic has occupied the road. 3:30pm We reach Dhule. As you are entering Dhule, there is a nice Hotel called Krishna. We stopped here for Lunch. 5:15pm As I was driving along, I decided to go around a stone but was not successful and the stone hit the tyre. If you look carefully, just before the truck cross the car, there is white stone very close to the curb on right side. We did not notice anything in the car excep a thud noise. 5:25pm The car sensors gave Low Air Pressure warning. We stopped to see if it was a puncture or something else. 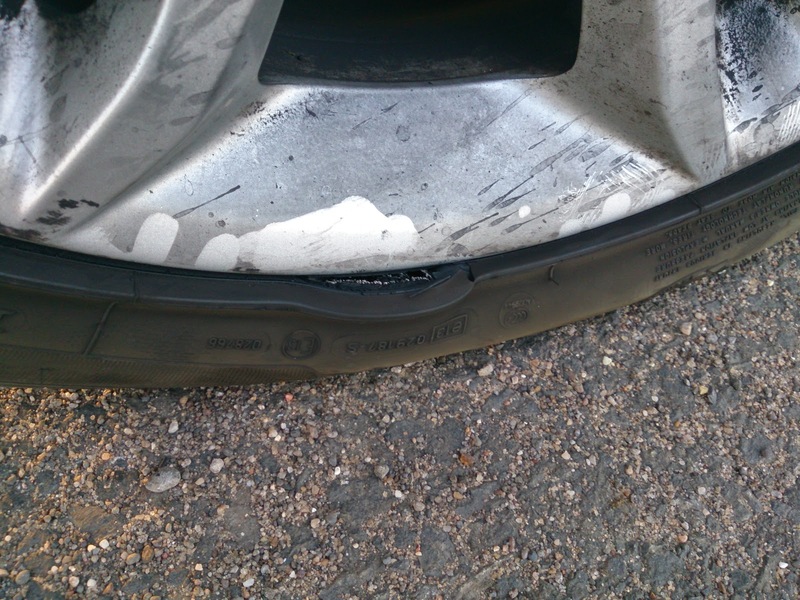 On closer inspection, we realised that side wall was ruptured and come off the rim. This was a serious problem, but since these were Run-On-Flat tyres, we decided to drive slowly, within the prescribed speed limit i.e. 80 kph. 6:00pm While we were driving, we called BMW and asked them if there is a way I can get tyre replacement. They offered to get the car towed if there was a problem but they could not get replacement tyre that day since it was already closing time. We confirmed that tyres were available in Indore and decided to worry about it the next day. 7:30pm We were in Pithampur. 8:30pm We crossed Indore city. We deliberated whether to stay in Indore city at some hotel or continue to Ujjain. Since the type looked in decent condition even now, we decided to continue to and come back the next day for repairs.